Ngāti Tama and Te Āti Awa (from Taranaki). Home to many tribes over the centuries, Te Tau Ihu (the top of the South Island) was rich in minerals such as argillite, prized for weapons and tools. 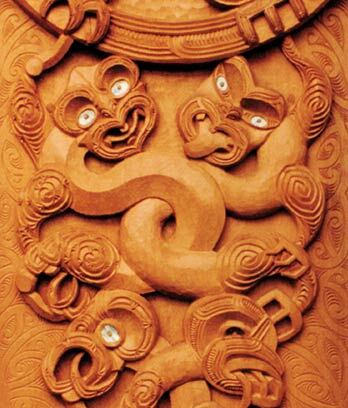 The legend of Kaiwhakaruaki, the man-eating monster, may have kept people from stealing these treasures, and protected important routes to greenstone resources further south. The early tribe Waitaha claimed descent from Rākaihautū, who had shaped the South Island’s mountains with his magic digging stick. Waitaha were gardeners, and enriched the soil which is still fertile today. Later, Ngāti Māmoe from the north, impressed by gifts of preserved eels and birds from Nelson, pushed out Waitaha and seized the resources for themselves. The Polynesian ancestor Kupe named many places, including Te Taero-a-Kereopa, the Boulder Bank which forms Nelson Harbour. When chasing Kereopa, who had kidnapped his daughter, Kupe was held back by this barrier of rocks falling from a bluff. The ancestors of Ngāti Kuia, a long-established Nelson tribe, arrived from Hawaiki on the Kurahaupō canoe. During the 16th and 17th centuries, Ngāti Tūmatakōkiri and other North Island tribes moved into the region. Māori encountered Europeans for the very first time in 1642, when the Dutch explorer Abel Tasman arrived at present-day Golden Bay. It ended in bloodshed: the Ngāti Tūmatakōkiri people killed four of his crew members. But when Captain James Cook arrived in the 1770s, relations were mostly friendly – Cook stayed for over six months in Queen Charlotte Sound. In the 1820s tribes from Kāwhia and Taranaki, led by the great warrior Te Rauparaha, conquered the region and began farming, building, and trading with whalers. From 1842 European settlers arrived. At first they got on well with Māori, and trade flourished, but questionable purchases of land caused trouble. Māori continued to lose ownership of their land for over 100 years, and tribal ways of life suffered. The Wakatū Incorporation was established in 1977. It has regained lands and started fishing, forestry and other ventures. They run many community projects, including marae restoration and health centres. In 2013, more than 8,800 people claimed affiliation with the Te Tau Ihu tribes.